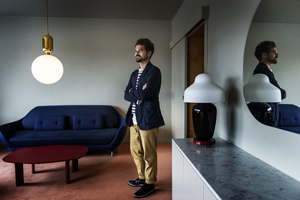 Jaime Hayon presented his own room in the Copenhagen design hotel Radison Blu (SAS Royal Hotel before), which has already been equipped with legendary furniture by Arne Jacobsen. The Spanish artist and designer designed the whole furniture for the room 506. In the end of the 1950s, the design legend Arne Jacobsen didn’t only design the unchanged room 606, which inspired the room 506, furnished by Jaime Hayon. 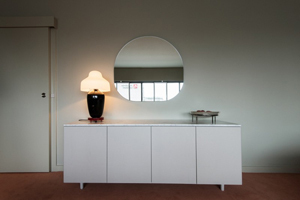 Jacobsen designed many furniture for the hotel, which soon were produced in collections because of their iconic shapes, and which are undisputed classic pieces today. The Egg, the Swan and the Drop wouldn’t exist without the ancient SAS hotel. The hotel, called Radisson Blu today, and managed by Roy Al Kappenberger, who was born in the 18th floor of the hotel. Roy Al Kappenberger is the son of the Swiss hotel director Alberto Kappenberger, with who Arne Jacobsen worked together during the phase of construction of the hotel. The director remembers how he ran through the corridors of the hotel in the uniform of the apprenticeships when he was a boy, as well as all the famous guests who lived there: Members of the royal family, important politicians, film actors and rock stars. ”Arne Jacobsen was a visionary. A genious, who was ahead of the times” , explained Kappenberger. Something remained unchanged while the hotel did change: the room 606, which still breathes the spirit of Jacobsen today. Kappenberger re-vitalized the big history of the house together with the (then as well as today) manufacturer Fritz Hansen, since he loves design, and he wanted Jaime Hayon to exclusively design one room in the tradition of Jacobsen. As real multitalented in creating and designing things of all styles, Hayon is a really worthy designer therefore. Hayon designed carpets, bed linen, lamps as well as the artworks at the walls in the room 506. All the objects have a mirrored expression tending to be organic, exclusive and aesthetical in their appearance. ”We achieved in evoluting the brand Frits Hansen in the past six years of our cooperation” , is what Hayon is sure of. ”I come from the Mediterranean design, it was a very special experience for me to leave some traces of my style in the Scandinavian scene.” The concept behind room 506 was to create a bright, friendly and very comfortable room – that succeeded. Time will show whether Hayon’s room will be as legendary as room 606 from Arne Jacobsen already is.